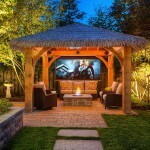 Wood pellet grills, though not as popular as their gas or charcoal counterparts, are slowly gaining popularity and all signs are pointing towards their continued growth. Wood pellets like charcoal grills have one benefit that makes them stand out. The smoke flavor that is infused in food. Everyone knows that food with charcoal is better tasting because of the rich smoky flavor and this is also the case with the best wood pellet grills from reputable brands, except for fact that, it only gets better with them. You see, the wood pellets used in these grills is made from all natural hardwood which ensures rich, quality smoke is passed to your food. But what’s even better is that these pellets come in many flavors including hickory, apple, cherry, maple, alder, mesquite, oak, just to mention a few. They also come in a blend of the different flavors. So these flavors are infused in the food to create meals that are not only pleasing to the taste buds but also to the nose as well-which is what you want right? An explosion of senses? So anyway that is mainly why pellet grills are finding their way into many homes. Another benefit of wood pellet grills is that when compared with charcoal grills, there is less clean up to be done with them. 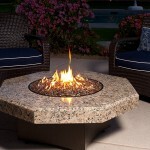 But this is dependent on the wood pellet manufacturer and perhaps the pellet grill itself. But some pellets like the Traeger pellets burn almost clean with no residue. 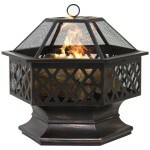 Construction: Features a high temperature durable textured powder coat finished steel frame with a 10 gauge porcelain enamel lid and micro polished stainless steel bull horn handles. Cooking area: Provides 702 sq/in inches of cooking surface. Cooking grates: Are made of ¼ inch durable stainless steel rod. Interior lighting: Includes dishwasher safe glass lens that can easily be removed. Push button ignition: With the push of a ceramic button, the REC TEC Wood Pellet Grill will automatically light and heat up to desired temperatures. Smart Grill Technology: Effectively maintains temperatures from 180ºF to 500ºF in 5º increments throughout the cooking process. Availability of shelves: Comes with large side and bottom which provide additional working spaces for prepping our food or holding your seasonings. Large hopper: Comes with hopper capable of accommodating 40 pounds of pellets so you won’t have to add pellets every now and then. Fire Pot: In the fire pot there is a 2 gauge stainless steel heat deflector and blower fan to prevent prevents hot spots hence even, consistent heat across your cooking surface. Roller blade wheels and locking casters: For easy movement around your patio and providing stability respectively. 12 gauge stainless steel drip pan: Into which food drippings and grease are channeled to minimize flare ups. Seams are carefully welded, powder coated, and caulked for triple protecting against the weather elements. 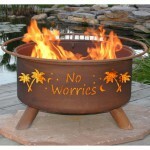 This means this wood pellet grill is not only sturdy, but is also durable. Complete value for your money considering its size, efficiency and durability. You can cook in multiple way including grilling, smoking, searing, and baking. Very generous cooking surface, the largest actually when compared to all the wood pellet grills on this list, hence suitable for cooking large meals. Temperature control over your cooking. It is able to precisely able to maintain the desired temperatures thus has the “set it and go” feature of an oven. Convenient plug and play construction that makes it possible for individual faulty components to be easily takes apart and replaced instead of replacing the whole grill. REC TEC grill is backed by a strong warranty of six years. No easy way to empty the pellets from the hopper nor does it have a removable ash pan. Vacuuming is the way to go with this one. 1. 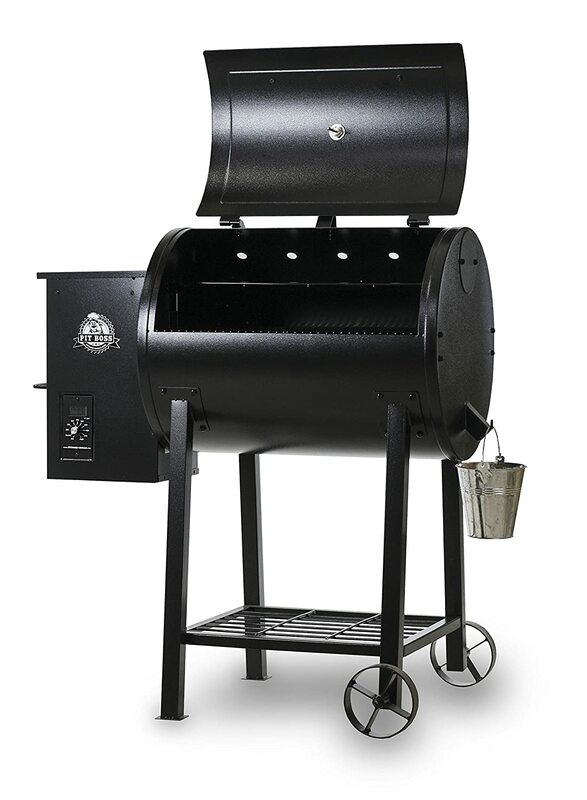 Steel construction: From the “original wood pellet grills manufacturers”, the Traeger Grills Lil Tex Elite 22 Wood Pellet Grill and Smoker is crafted from quality steel with a durable powder coating finish. 2. Generous cooking surface: Offers an expansive grilling space of 418 sq. inches to comfortably fit up to 16 burgers, 4 whole chickens or 5 rib racks. 3. Large capacity hopper with auger: Features a 18 lb capacity hopper that stores the pellets during grilling. 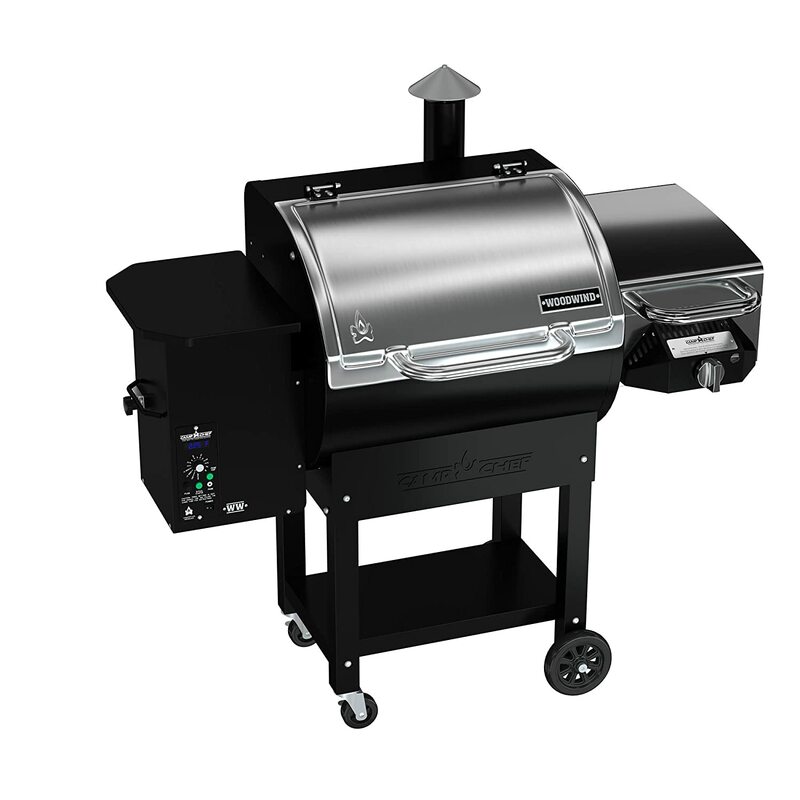 This large capacity hopper ensures a longer burn time for grilling, eliminating the need to add pellets every few minutes. The auger feeds pellets into the grill. 4. Digital easy-to-use thermostat with auto-start: The grill comes with a Digital Elite Controller that maintains precise temperatures within +/- 20 degrees F, allowing you to cook low and slow on the ‘Smoke’ setting to hot and fast at up to 450 degrees. You can also keep track of the temperature of your food easily with the LED display. 5. Push button powering: Features a no-fuss electronic auto-start ignition for easy and fast start-ups. 6. Easy to clean grates: The porcelain grill grates have a non-stick surface that makes cleaning easy and hassle free. 7. 6 in 1 pellet grill: It enables you the option to cook 6 ways, whether you want to grill, smoke, bake, roast, braise, or barbecue you can do it all this grill. This grill offers you consistency you can trust with the help of the Digital Elite Controller. It allows you to create delicious foods every time and by just setting the temperatures to desired level and just waiting for it to do its thing, with ease. 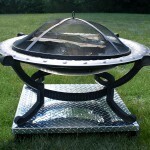 The quality steel construction with powder coating finish of the grill frame is durable and expected to last for years. You have control over how much heat goes into making your food, whether it’s hot and fast or low and slow. It is a versatile grill that enables you to cook in six different ways. It is easy to use and as we mentioned earlier the heating system for Traeger Lil Tex wood pellet grill is digitally controlled. You can adjust the temperature as you want. Another benefit of the Digital Elite Controller is that it allows you to simply power up the grill, set the set to the temperatures you want and just go be busy somewhere else if you wish. No baby sitting. Traeger offers several convenient grilling accessories such as folding shelves for additional working space and insulation blankets, that will allow you to customize your pellet grill for added versatility and convenience. They are however bought separately. You get value for your money as this grill will last for years not to mention it is efficient in cooking. Maximum temperatures for this grill is 450 degrees while other brands can get as high as 700 degrees. 1. Digital temperature control with Dual LED temperature read out: You can set your temperatures from about 160° F up to 500° F. The dual LED temperature read out is both for internal cooking temperatures and internal food temperatures. 2. Smart auger: The auger works with the Digital temperature control to automatically dispenses pellets into the grill for consistent heat. 3. Electronic auto-start ignition: For easy and fast powering. 4. Removable Upper warming rack: This is one of the features that sets the Camp Chef Wood Pellet Grill from other wood pellet grills. It comes with a warming rack which provides an additional surface for cooking your foods. 5. Ash clean-out system: This is another feature that is not common with many wood pellet grills. This feature makes cleaning that much easier by allowing you to simply pull a lever to empty the ash from the fire box, instead of vacuuming out the whole grill, as is the case with many pellet grills. 6. Large capacity pellet hopper. The 18lb hopper is large enough to accommodate enough pellets for a long grilling session. 7. Large cooking area. 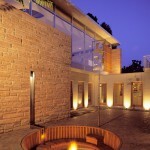 Offers 429 sq. inches of cooking surface plus an additional 141 sq. inches of warming rack cooking area, making a total of 570 square inches of cooking surface. 8. Includes accessories and features: Comes with a meat probe, front and side shelves for additional working spaces, and a Pizza Stone, all to help make your outdoor cooking experience more efficient. No baby sitting required, you just set the temperatures you desire and walk away. Very generous cooking area for medium sized cooking needs. Unlike most pellet grills, this grill comes with front and side shelves which conveniently provide additional working spaces for food prepping or placing your seasonings. 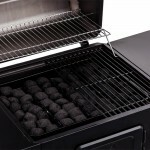 Super easy to clean unlike most other wood pellet grills that require vacuuming. It’s versatile in that you can use it to cook in multiple ways. It’s easy and stress free to use with its smart auger and digitally controlled temperature. It is worth every penny based on its durability and efficiency. Powder-coated steel construction: To ensure the durability. Porcelain-coated cast iron grids: These quality constructed and long lasting cooking grates are easy to clean. Easy to operate Digital Control with LED read out: Allows you to control the cooking temperatures from between 170° to 600°F. 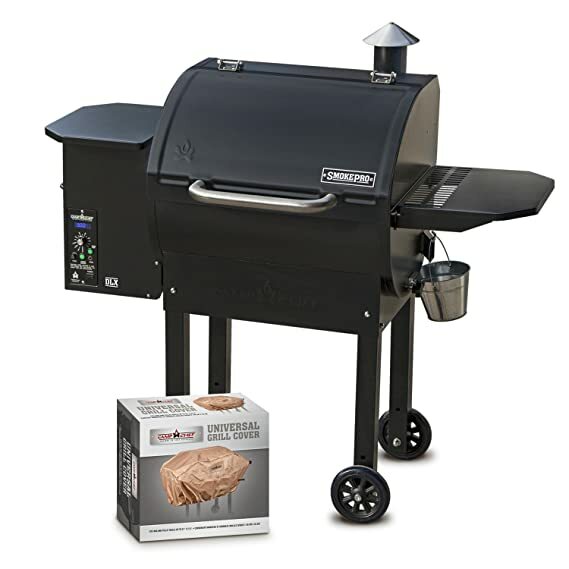 Flame Broiler: This Pit Boss Pellet Grill includes a flame broiler that gives you the option to grill directly over open flames, adding flavor back to your food and funneling excess grease away. Upper rack: Comes with a removable warming rack with a cooking area of 240 sq. in. for additional cooking space. Large cooking area: It provides 507 sq. in of main cooking surface and 193 sq. in. of removable upper rack for a total of 700 sq. in. combined area of total cooking. Electronic ignition: For fast and hassle-free lighting. Smart auger: The auger automatically feeds the pellets into the grill for consistent heat. Hopper capacity: Comes with a 8 lb capacity hopper. 2 durable wheels: For mobility around your patio or backyard. Versatile to allow you to cook six ways including grilling, baking, roasting, braising, smoking and searing. It is durable and strong, made to last. Includes a flame broiler for all your open flame searing needs. Easy to use dial-in temperature control with LED display for complete control and monitoring over your food. Easy to clean by just taking out the catch pan and emptying it, without the need to vacuum the whole grill. Very expansive cooking area of a total of 700sq. inches. No need to babysit as the digital control allows you to set the grill to desired temperatures and walk away. Some customer have has issues with getting their pellet grill to maintain the desired temperatures as it seems to go on high even when set on low. This is a problem because that it means you’re have to constantly keep an eye on your food instead of “setting and forgetting” common with other pellet grills. These may however be a problems with some select grills. 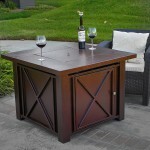 Steel construction: Made of quality steel with a durable powder coating finish. Cooking surface: Offers 300 sq. inches of grilling area. Porcelain grill grates: The grates are non-stick in nature for hassle-free cleaning. Digital Elite Controller with LED read on: Comes with a Digital Elite Controller that maintains precise temperatures within +/- 20 degrees. You have complete control over your cooking temperatures allowing you to control your cooking temperatures up to 450 degrees. Electronic auto-start ignition: With the flip of an on switch your grill is set for cooking which eliminates the need for fire starters and matches. EZ-fold Legs: Perfect for tailgating and camping hence the name “Tailgater Wood Pellet Grill”, this grill features The EZ-fold legs which makes it compact when the legs are folded for easy packing to take wherever on the go. Hopper Capacity with smart auger: Includes a 8 lb capacity hopper for holding the pellets and an auger that automatically releases pellets into the grill. 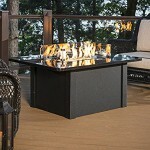 Unique fold-able legs are not common with many pellet grills enhances its portability when it’s time for tailgating and camping. It is a durable grill that will serve you well. Whether you’re feeling like you want to grill, barbecue, bake, roast or braise, it is all possible with this grill. Digital Elite controller allows you to set your grill and go, just like an oven. Complete control over cooking temperatures. Lower maximum temperatures of 450 degrees. Body frame and grill grates: The grill is crafted from quality steel while the grates are crafted from cast iron with enamel-coating. Digital temperature control with automatic auger and Dual LED temperature display: The digital temperature control allows you to set the temperatures from 160° F up to 500° F. and go be busy somewhere else as the grill does all the work for you. The automatic auger feeds pellets into the grill to maintain the heat and produce optimal amount of smoke. No-fuss ignition: Comes with a built-in ignition. Simply switch it on and your grill is up, running, and ready to go. Warming rack: In addition to the main grilling area, this grill comes with a removable upper warming rack for additional cooking space. Cooking area: Provides 570 square inches of cooking surface area including the removable upper warming rack cooking surface. Searing box: For crisp, caramelized searing, this wood pellet grill includes a stainless steel constructed sear box which comes with heat diffuser plates for infrared cooking while achieving temperatures of up to 900°. Ash Clean out system: Their grill cleaning system eliminates the need for vacuum cleaners and other blowers. All you have to do is pull a lever and empty the ash from the fire box. Grease management system with drip tray and meat probe: This minimizes flare ups. Hopper Capacity: Hopper can hold 18lbs of pellets. Bottom shelf: For your storage needs. Four legs: All of them wheeled for easy movement. 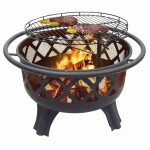 This is a durable well constructed wood pellet grill. You can grill, braise, smoke, bake, roast,and sear all your favorite foods with this grill. Gives you complete temperature control to be able to cook with temperatures ranging from high to low. Effective in temperature control and offers the convenience of an oven- set and go. Generous cooking surface area to fit families with medium cooking needs. The ash clean out system and grease management system makes cleaning easier. Can be very loud and with rattling noises. 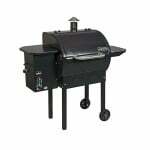 Like any other grill or house equipment, grills are available in a range of prices. The ones constructed with quality and efficiency being a priority are obviously more expensive. 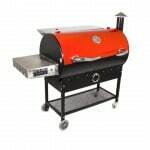 Generally though, good pellet grills range from around $450 to as high as $1200 or more. A grill like the above REC TEC Wood Pellet Grill offers a very expansive cooking surface of 702 sq, inches suitable for large cooking needs. 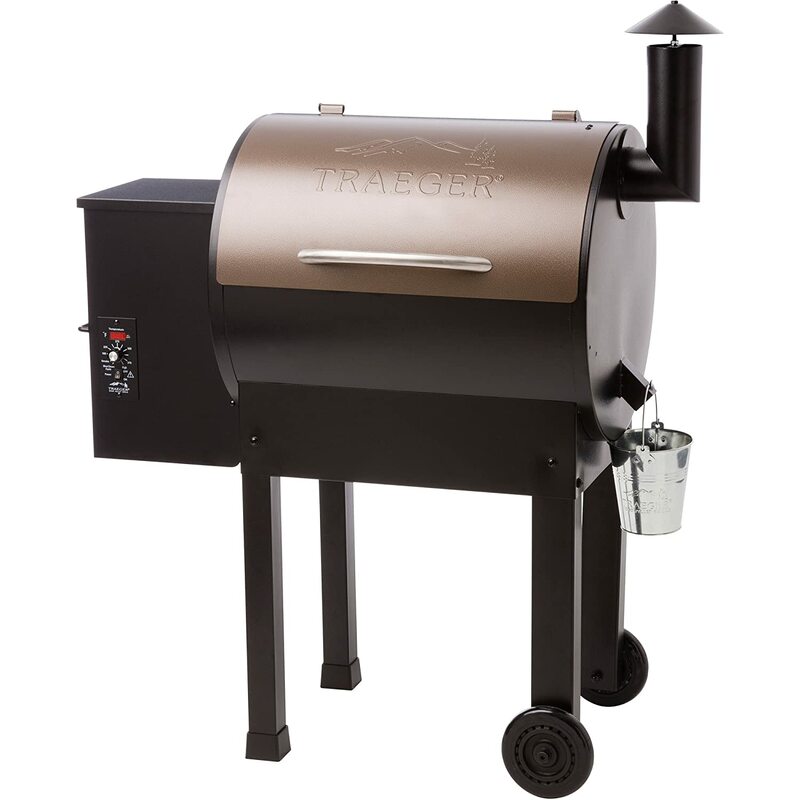 Others like the Traeger Grills Tailgater 20 Wood Pellet Grill and Smoker offer just 300 sq. in. of grilling surface. Yet The Traeger grill is still very popular. 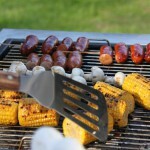 You need to evaluate your grilling needs before you go shopping for a grill. 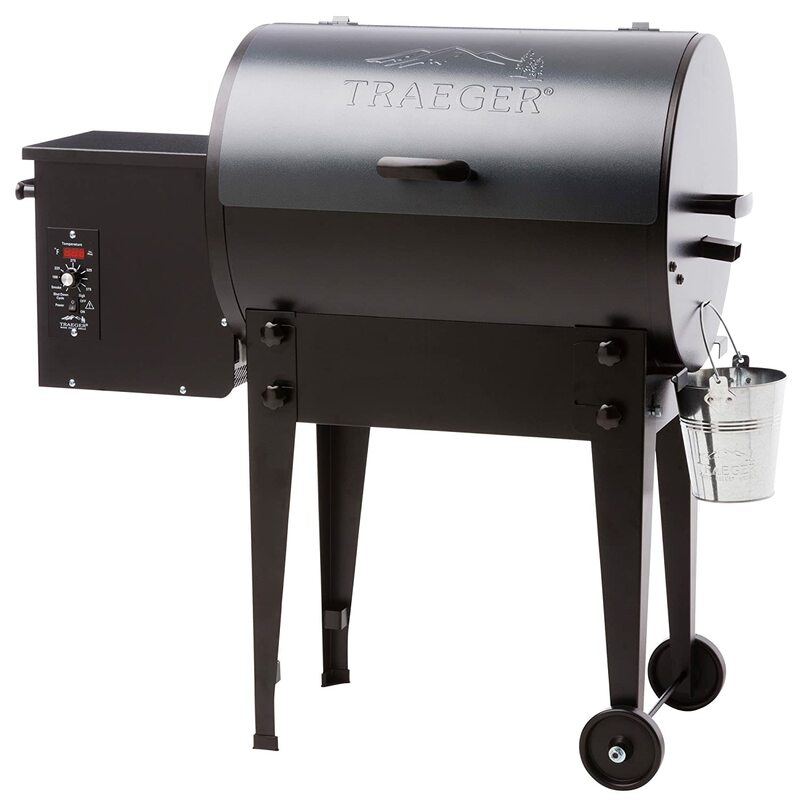 Different grills, different grilling temperatures, with some grills having temperatures as high as 700° F. The Traeger grills have the lowest temperatures on this list of 450° F, yet they still seem to be selling pretty well. The saying “you get what you pay”, in most cases usually holds true. Pellet grills that are solid and made of quality heavy duty materials are usually guaranteed to be durable hence usually higher priced. 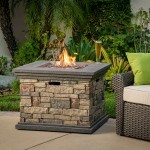 So before you go out shopping for a pellet grill, know what kinds of grill you want and how long you want it to last. But some advice? What’s a little more expense when you’re guaranteed of durability and efficiency? In the grilling industry, convenience is a major factor to consider. Grills come with a variety of beneficial features such as side shelves, bottle openers, hanging hooks, meat probes, internal lighting, lid handles, bottom storage shelves, sear/ smoker boxes, drip buckets and so much more. 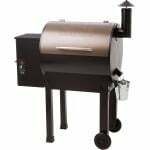 The good thing is you may find a wood pellet grill with a particular added features at the same price range as one that is just plain and simple with no memorable features to write about. So look around familiarize yourself with the various features pellet grills come with, before you miss out on a really great and convenient grill that would have made your grilling experience all the more better. From experience, cleaning a pellet grill can be a very difficult task to accomplish especially for grills without an elaborate cleaning system. For these kinds of grills, a vacuum in necessary to clean which can be time consuming, whereas with some grills like the Camp Chef Pellet grills, cleaning is as easy as removing and emptying the ash pan. I don’t know about you but personally, I like a grill that allows me to cook in several ways including roasting, grilling, searing, braising, baking or smoking. Good thing all the above grills are versatile in that way and allow you to cook at least 5 ways. This will save you a lot of head ache and save you the trouble of baby sitting your food as it cooks. With this device built-into your pellet grill, it monitors the grill temperatures and maintains the cooking temperature you set for your food, just like an oven! So all you have to is just dial in the temperatures you want and leave your grill to do the rest. These are the main things we think are important to keep in mind when buying a wood pellet grill but of course, there are other factors you may want to consider such as the availability of a hopper purge system that allows you to clean the hopper and, availability of a grease management systems for channeling grease and oils in to drip pan for easy disposal while minimizing the unanticipated flare ups. All in all, Whatever features you may have in mind, we believe the above wood pellet grills are some of the best in the market and this can be attested by their popularity.